Ratek Instruments has grown to become a leading manufacturer of laboratory equipment for use in the Industrial, Scientific and Medical Research fields. Operating from a modern facility in Melbourne's outer Eastern Suburbs, all equipment is designed and produced in house by our production team. We take pride in the products we deliver and the service we provide our customers. We recognize that our customers must be able to depend on our products, our service and our management to maintain successful relationships. An extensive range of high quality equipment is now offered, backed by a commitment to quality, reliability and customer satisfaction. The continuing research and development effort has ensured that the current range of products offered is comparable in quality to that available from anywhere in the World. As a manufacturer, our reputation has been developed on the basis of solid and reliable product performance over many years. Our competitive advantage is our ability to deliver technicial support for everything we make, and overnight access to spare parts for all current models. We deliver true customer service throughout all stages of a product's lifespan, from evaluation to sales, onto technical support and ongoing service.The hundreds of laboratories filled with Ratek equipment commissioned over many years is testament to the reliability of our products, and the ongoing relationships we build with our valued customers. One of the keys to Ratek's ongoing success is the quality of our employees in all departments. We employ talented and experienced staff and ensure that they are involved in the ongoing evolution of our company and product range. We maintain a fully skilled workforce with experience in all aspects of sheet metal and plastic fabrication, fitting, machining and assembly. All electronic and mechanical assembly is carried out in house to ensure that the high standard and traceability required by our Quality Assurance system is maintained. Ratek's team of managers is a mix of experienced trade and industry professionals who are focused on establishing sound manufacturing and business management systems. We have invested heavily in our computer and software systems to improve the service levels we can offer, streamline production and ultimately increase production capacity over time. 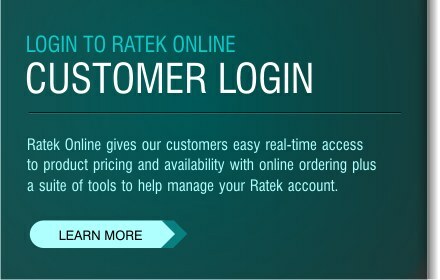 We are always endeavouring to use technology to the mutual advantage of our customers and ourselves, and happily invite our customers to work with us in integrating their computerised operations with Ratek. We maintain a comprehensive and modern workshop equipped with the latest computer aided manufacturing machinery. We are always striving to improve our manufacturing proceses using the latest tools and techniques with a view to improving the quality of our products. Regular maintenance is carried out and critical calibration equipment is managed by our Quality Assurance system to ensure consistent and accurate product performance. We operate a custom-written manufacturing, job costing, stock control and stock tracing system which allows us to plan production effectively and provide reliable lead times to our customers. Our web interface delivers real time stock information and allows our customers to get the information they need when they need it. If your company would like to discuss integration with your own ERP software, please contact us.